A brave little Hillsborough girl, whose courage inspired friends and family to raise thousands of pounds in her name, this week lost her fight against cancer. For more than a year Cariss Dempster battled Neuroblastoma, a rare cancer annually affecting some 100 children in the UK, but on Tuesday, just over a week after her seventh birthday, she passed awayy. Mourners will gather at Dromore’s Banbridge Road Presbyterian Church at noon tomorrow (Thursday) in support of Cariss’s parents, Noel and Elaine, her sister Korin (10) and wider family circle. When contacted by the Star a family member said everyone concerned was “just devastated” by Cariss’s loss. A pupil at Dromore Centrral Primary School and a member of First Dromore Girls’ Brigade, the local youngster was just five years old when she was diagnosed with Neuroblastoma. Her shocked family was touched by the many people desperate to help and young Korin harnessed their generosity by embarking on a fundraising campaign, with the help of the girls’ adult cousins Claire and Hollie McDonald, in aid of CLIC Sargent, the Neuroblastoma Society and the children’s cancer unit at the Royal Belfast Hospital for Sick Children. 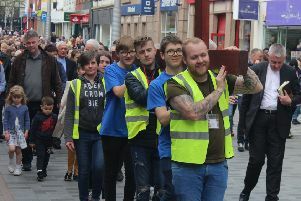 Hundreds turned out for a variety of fundraising events, with more still in the pipeline in recent weeks. It was on Korin’s fundraising Facebook page in early September that the family revealed, “with a heavy heart” Cariss’s cancer had returned. Again, hundreds of people responded. Among them, Alison Smith said: “There are no human words to adequately express the sorrow we feel for you all. Praying that The Lord Himself will hold you all in his arms and comfort you as only He is able. We are praying for you all and remain inspired by your courage over the last number of months.